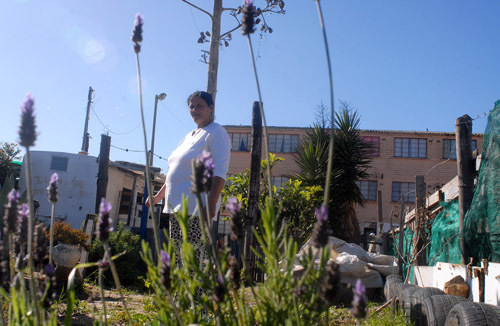 THE poverty, drugs and gangsterism that pervades life in Lavender Hill on the sandy Cape Flats toward False Bay has always been at odds with the suburb’s name. But a group of women who refused to give in to the social milieu surrounding the suburb apartheid created for coloured people, and have spend a decade trying to put the lavender back into Lavender Hill, are finally seeing their efforts paying off. As 60 year old Joan Everson shows off her garden and explains what each plant is and what its medicinal uses are, she beams with pride. Everson grows cabbages, cauliflowers, onions, potatotoes, carrots, beetroot, and strawberries. Young plum and peach trees are starting to bloom, and lilies, roses and lavender provide dashes of colour. The growing of peace gardens was an initiative that was first started by women associated with the New World Foundation NGO in Lavender Hill ten years ago who decided to establish community Peace Gardens in the courts of the tenement blocks that are synonymous with crime and poverty in the area. “We went from door to door asking people what they wanted to see in Lavender Hill. Everyone agreed the place needed to be cleaned up and to look pretty, so we decided on the gardens. We needed a new Lavender Hill,” said Everson. “The vision was to grow lavender gardens all over as there was no lavender in Lavender Hill. We wanted to beautify the area and take ownership of the land from the gangs. But we also wanted to grow vegetable gardens because of the poverty,” said Greg Philander, head of the Women’s Department at New World Foundation. There are now colourful gardens dotted around the neighbourhood in or next to courts where gangs once congregated, providing colour and beauty in the bleak and windswept area. Unexpectedly, some gang members began to take pride in the gardens. “Even if gang warfare took place, they never destroyed the gardens,” said Philander. “The gangs helped us with the gardens, though some did want money in return. But it was a pleasure for them to do it,” said Everson. But for every success, there’s been a failure. While the Peace Gardens have spurred many residents to establish their own private gardens, many of the original Peace Gardens have succumbed to the downward pull of poverty. Shirley Nel’s garden has become a rubbish dump since her water point broke. Seventy year old Gadija Joseph’s tap was stolen and the water cut off, leaving her unable to water the garden she started five years ago, although her palm tree, wild flowers and banana tree survive. Her plants were also often pulled up by vandals. “I used to sit and cry in the garden when they broke my plants,” said Joseph, whose garden is located opposite a drug den. But the community’s continual efforts are now being taken forward by social entrepreneurs. Businessman Charles Maisel, who established the successful Men at the Side of the Road. Having started in May this year, the Lavender in Lavender Hill project has established a lavender nursery at Zerilda Park Primary with a second one about to be set up at Lavender Hill Secondary school in order to grow the plant commercially, as well as establish fields of lavender in the area. Budding entrepreneur Marcelle van Zyl, who works with nursery manager and trainer Vuyisile Dyolotana, said they obtain lavender cuttings from the public and so far about 18 000 cuttings have been donated. Once the lavender is mature it will be planted on open ground and the first lavender patch has already been grown at a spot which was once a popular drug hub, said van Zyl. With plans to harvest the lavender for commercial use, the vision is to create employment and impart skills. Five young men have been trained and are working at the first nursery.